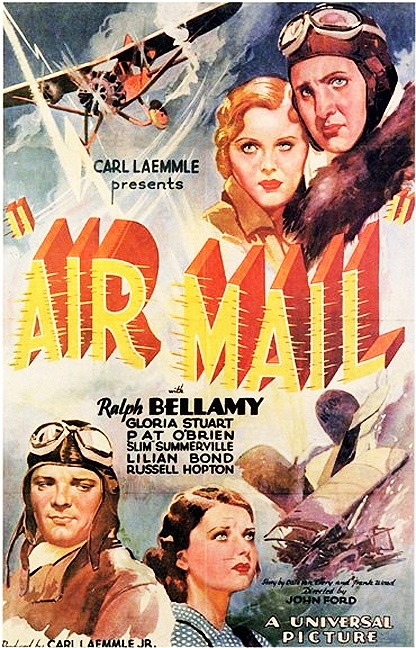 Air Mail (1932) - John Ford directed this look at the US Air Mail Service, from Universal Pictures. Ralph Bellamy stars as Mike Miller, the tough boss of an air mail station and supervisor over a number of pilots. The hazards are many, and turnover in the ranks is frequent as many pilots crash, permanently injuring themselves or, more likely, dying. After one such death, hot-shot former war ace Duke Talbot (Pat O'Brien) joins the service and immediately starts rubbing everyone the wrong way. But when the chips are down, he may be the only one who can save the day. Also featuring Gloria Stuart, Lillian Bond, David Landau, Russell Hopton, Slim Summerville, Leslie Fenton, Frank Albertson, George Irving, Jack Pennick, Jim Thorpe, and Ward Bond. Source: YouTube, from a recording off of AMC. 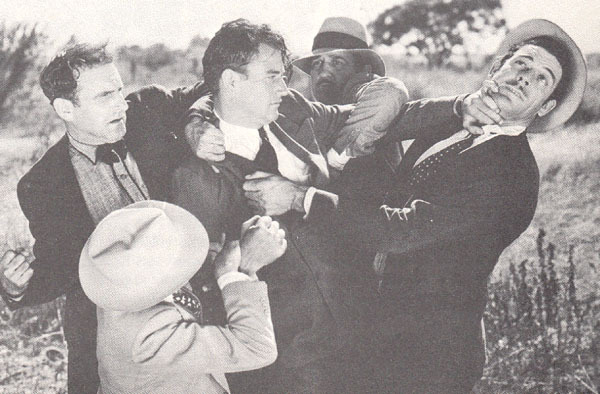 The Hurricane Express (1932) - Action-packed serial from Mascot Pictures and directors J.P. McGowan & Armand Schaefer. John Wayne stars as Larry Baker, a square-jawed pilot who vows revenge when his father, the conductor of a train named the "Hurricane Express", is killed by the "Wrecker", a mysterious master of disguise who, along with his gang of henchmen, is after a gold shipment. Larry is assisted by Gloria (Shirley Grey), a young woman posing as a railroad company secretary in order to find the evidence to clear the name of her falsely-convicted father. Also featuring Tully Marshall, Conway Tearle, Edmund Breese, Lloyd Whitlock, J. Farrell MacDonald, Fred "Snowflake" Toones, Yakima Canutt, and Glenn Strange. 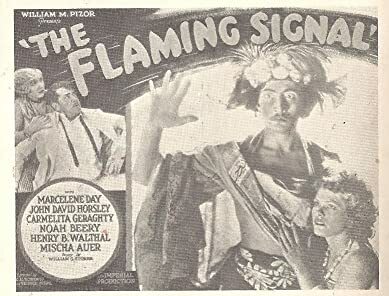 The Flaming Signal (1933) - Ridiculous turkey from the little-known Imperial Productions company and directors George Jeske and C. Edward Roberts. Flash the Wonder Dog gets top billing and "plays himself". He belongs to famous daredevil aviator Jim Robbins (John Horsley). When Jim and Flash set out on a trans-Pacific flight, they experience trouble and crash in the waters near a remote island south of Hawaii. After Flash parachutes to safety (!) he finds local white girl Molly (Marceline Day), the daughter of the kindly Rev. Mr. James (Henry B. Walthall), and she escorts Flash and Jim to the one hotel on the island. It's run by the sleazy Otto Von Krantz (Noah Beery Sr.) who takes advantage of the primitive natives and their pearl diving efforts. Unfortunately for Flash and Jim, it will be some time before a rescue can arrive, and things among the islanders are heating up. Also featuring Francisco Alonso, Mischa Auer, and Carmelita Geraghty. [SPOILERS] I have to put the warning because this camp-fest requires some discussion. First off, Horsley is terrible, one of the worst actors that I've seen. However, even the cast of veterans are bad, especially Beery, who drunkenly garbles his dialogue when he isn't just indiscriminately grunting. Alonso, as the main young islander, looks about as Hawaiian as Tony Bennett and sounds like he's auditioning for the role of Tonto. The Native American similarity doesn't end there, though, as in a later scene, one of the movie's most inscrutable, the islanders conduct some sort of ceremony led by a guy in what appears to be a buffalo headdress, which would be quite remarkable for a south Pacific islander. The oddball title refers to a stunt performed by Flash where he runs with a lit torch in his mouth. That must have resulted in some painful days for old Flash when he was being trained. On a normal scale this rates a 3/10, but on the so-bad-its-good meter, its a solid 8/10. Source: YouTube. The print I watched was too dark. Poor Flash is nowhere to be seen on the poster. That does seem to have been the heyday of the dog action hero. Sounds like the best actor in the film was the dog! In the Wake of the Bounty (1933) - Laughable Australian film that's a mix of poor historical reenactments and documentary footage, from writer-producer-director Charles Chauvel. A crusty old sailor tells some other crusty old sailors the story of the HMS Bounty and the mutiny, led by Fletcher Christian (Errol Flynn), against the tyrannical Captain Bligh (Mayne Lynton). The second half of the 1-hour movie is documentary footage of Pitcairn Island in contemporary (1932) times, showing the society that has evolved there descended from the mutineers and their Tahitian wives. Jungle Bride (1933) - Goofy junk from Monogram and directors Harry Hoyt and Albert Kelley. A ship sinks off the coast of Africa, and only four survivors make it to shore: Gordon Wayne (Charles Starrett), a guitar-playing nice-guy who has been accused of killing a cop back in the U.S.; Doris Evans (Anita Page), the sister of the man "wrongly" convicted of the crime, and who made it her goal to see Gordon arrested in Europe and brought back to the U.S.; John Franklin (Kenneth Thomson), a law enforcement officer who actually did the arresting of Gordon, and who is set on taking him back for trial; and Eddie Stevens (Eddie Borden), Gordon's comic-relief buddy. These four try to make the best of their situation, constructing primitive huts when not battling fierce lions and laughing at the chimpanzees. Tarzan the Fearless (1933) - Another take on Edgar Rice Burroughs' iconic jungle hero, this time from the Principal Distributing company and director Robert F. Hill. Buster Crabbe stars as the title character, a white man raised by apes in Darkest Africa who has become an almost legendary figure among the natives. When a group of Americans and Europeans arrive in the jungle to look for a missing compatriot, Tarzan meets the lovely Mary Brooks (Jaqueline Wells), whom he continuously has to rescue from savage beasts, wild tribesmen, and crooked jewel thieves. Also featuring Eddie Woods, Philo McCullough, E. Alyn Warren, Matthew Betz, Frank Lackteen, Darby Jones, Carlotta Monti, and Mischa Auer. The Three Musketeers (1933) - Average action serial, an updating of sorts of the Dumas novel, from Mascot Pictures and directors Colbert Clark and Armand Schaefer. The "musketeers" are soldiers in the French Foreign Legion: Clancy (Jack Mulhall), Renard (Raymond Hatton), and Schmidt (Francis X. Bushman Jr.). They are stationed in North Africa where they battle frequent Arab uprisings. During one such battle they are saved by American military pilot Tom Wayne (John Wayne). When Tom is later framed for murder by the insidious "El Shaitan", mysterious leader of the Devil's Circle, the three legionnaires promise to help Wayne is whatever way they can, leading to much high-flying mayhem, desert sands survival, and dangerous shoot-outs. Also featuring Ruth Hall, Lon Chaney Jr., Noah Beery Jr., Hooper Atchley, Gordon De Main, Robert Frazer, and Robert Warwick. Interesting write-up on the Musketeers movie. Of course, Mascot and a few other small independents would be melded together to form Republic Pictures. And in 1936 Republic began its long-running THREE MESQUITEERS series with Robert Livingston. John Wayne would costar in eight of those B westerns (a total of 51 were produced). Nat Levine served as producer. The Whispering Shadow (1933) - Wild action serial from Mascot Pictures and directors Albert Herman and Colbert Clark. Two-fisted shipping company foreman Jack Foster (Malcolm McGregor) is determined to avenge the murder of his brother, a delivery driver for the same company who was killed by agents of the Whispering Shadow, a mysterious figure leading a criminal gang who keep attacking deliveries made by the company. Company president Bradley (Henry B. Walthall) also enlists the aid of noted detective Robert Raymond (Robert Warwick) to assist Jack in his efforts. All signs point to the culprit being a creepy magician named Professor Strang (Bela Lugosi) who operates a wax museum out of his House of Mystery. Also featuring Viva Tattersall as Strang's lovely daughter and accomplice, Karl Dane as a goofy comic-relief radio operator, Roy D'Arcy and Lafe McKee as shady company employees, Ethel Clayton, Lloyd Whitlock, Bob Kortman, and Yakima Canutt. British Agent (1934) - Suspense and intrigue set against the backdrop of revolution-era Russia, from First National and director Michael Curtiz. Leslie Howard stars as Stephen Locke, an agent for the British government stationed in Moscow shortly after the first Russian revolution. The allied forces are afraid that the post-revolution government will withdraw from World War One, allowing Germany to send their eastern front forces to the west where they would most likely overrun the battle-weary armies of Britain, France, the U.S. and other allies. The Russians vow to stay in the fight, but when a second revolution occurs, installing the Soviets led by Lenin into leadership, things change, and a ceasefire with Germany is imminent. Locke stays in Russia despite increasing danger to himself, in an attempt to convince the Soviets to stay with the fight. It doesn't hurt that he's also fallen in love with a Soviet agent, Elena (Kay Francis). Also featuring William Gargan, Cesar Romero, Irving Pichel, J. Carrol Naish, Phillip Reed, Ivan F. Simpson, Halliwell Hobbes, Walter Byron, Tenen Holtz, and Paul Porcasi. Since Howard is my favorite actor and I like Francis and Curtiz is a capable director (you think! ), I when to watch film thinking how could it not be great. But yea, just something lacking from this film that prevents it from being top notch. Last week I watched "The Matrix", "MI5", "G-Force", G-Force was a cool and hilarious movie. This year I am looking to watch MI6, Bad Investigate, a Netflix original called Game Over Man and Ready Player One. I believe that Ready Player One is going to be awesome; it shows how virtual reality dominates the future. Mission Impossible - Fallout (2018). This franchise seems to get better with each installment. The filmmakers have found a way to keep the action – land, nautical and aerial – fresh and enthralling. (A fight set piece that takes place inside a posh men’s room is downright operatic). We know about Tom Cruise preferring to do his own stunts, but the entire cast fully believes in, pardon the pun, the mission, i.e. the movie they are making. There are no self-conscious winks at the audience. IMF superspy Ethan Hunt (Cruise) and his team, which includes neurotic computer whiz Benji Dunn (Simon Pegg), and tech whiz Luther Stickell (Ving Rhames) - the three of them have great screen chemistry, one of the best aspects of the picture - race against time to retrieve stolen plutonium in the hands of an international terrorist ring known as The Apostles. Angela Bassett, playing CIA chief Erika Sloane, views the IMF as an out of control wrecking ball, and assigns Hunt a chaperone of sorts. That would be Henry Cavill’s August Walker, a smooth assassin who sneers at IMF’s old school espionage techniques. Solomon Lane (Sean Harris) is back as the nihilist villain; even in jail he’s able to control events. There are plenty of plot twists. Allegiances are tested as to whose side the assortment of characters is on. Vanessa Kirby, playing an arms broker named The White Widow, is a nice addition to the cast, which includes Rebecca Ferguson as Ethan’s love interest/possible double agent, and Alec Baldwin as the IMF boss. I’m already looking forward to the next installment. The Girl in the Spider’s Web (2018). Claire Foy steps into the shoes of Lisbeth Salander, the feminist avenger and hacker extraordinaire. Lisbeth’s mission is to hurt men who hurt women. The plot involves a syndicate trying to acquire nuclear weapons. Haven’t we seen this before? The syndicate is led by Lisbeth’s sister, Camilla, played by Sylvia Hoeks, who was great in Blade Runner 2049 and is excellent here. Unfortunately, she doesn’t appear until late in the second act. Camilla has taken over the crime ring from her father, a monster of reprehensibility. The damage he inflicted on his daughters is a theme that appears early on, and then resurfaces at the end. The actions set pieces and fight scenes are above average. Nonetheless, it looks like a pastiche of past similarly-themed films. Claire Foy’s Lisbeth is cold and inscrutable, but Foy is a great actress and finds her character’s humanity. LaKeith Stanfield plays an American NSA officer seeking to obtain the valuable nuclear codes that were stolen from the American government. The film is enhanced by the gray gothic atmosphere provided by the Scandinavian winter. Despite all the fancy weaponry showcased: computer viruses, lethal syringes, the most lasting comes from an old-fashioned emotional guilt-trip one of the characters will have to live with. I give this film a B.
Awk. I will be severed from all connection with TCM for the next three months. That'll be my next chance to see an classic adventure/action movie.